Panaji : ‘Ishti’, the opening feature film for the Indian Panorama, is set in the mid-twentieth century Kerala, when young Namboothiri Brahmins successfully challenged the orthodox, the patriarchal traditions of their community which allowed the Patriarch, the eldest male member of the family, sole control of the family property and denied normal education to its members, particularly women. The film has a feminist angle as well. Director and script-writer of the film, Prof. G. Prabha, is a professor of Sanskrit and a multi-linguist. 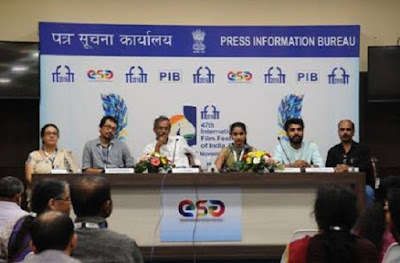 Addressing a press conference in IFFI 2016, Goa, today, the Director said that “Sanskrit was not given its due place and space during linguistic reorganisation of the States.” Therefore, as a Sanskrit professor the use of Sanskrit as a medium for the film was a natural choice for him. The film is an effort to portray the society of the times through the eyes of a girl child. ‘Ishti’ in Sanskrit means Search for Self and the film portrays the woes of a Namboothiri family forced to live in darkness of ignorance by the eldest male member of the family. Responding to questions from media the Director said regarding shooting most of the film at night, he said, it was a conscious decision to symbolise the journey of the protagonist from darkness towards light in the lives of respective characters.